Our Journey this week took us first to Nanuet, New York where we again partnered with the amazing Roxanne Watson. April is National Donate Life Awareness Month. It’s important to note, because our stop with Roxanne is precisely due to her intense drive to raise the total number of New Yorkers who are signed up as potential donors. Roxanne and Live on NY, held the event at Rockland Community College. New York as a State, falls very low on the list of percentage of people who are signed up to donate. I wont embarrass them by listing how low this ranking is, but suffice to note it needs to rise. 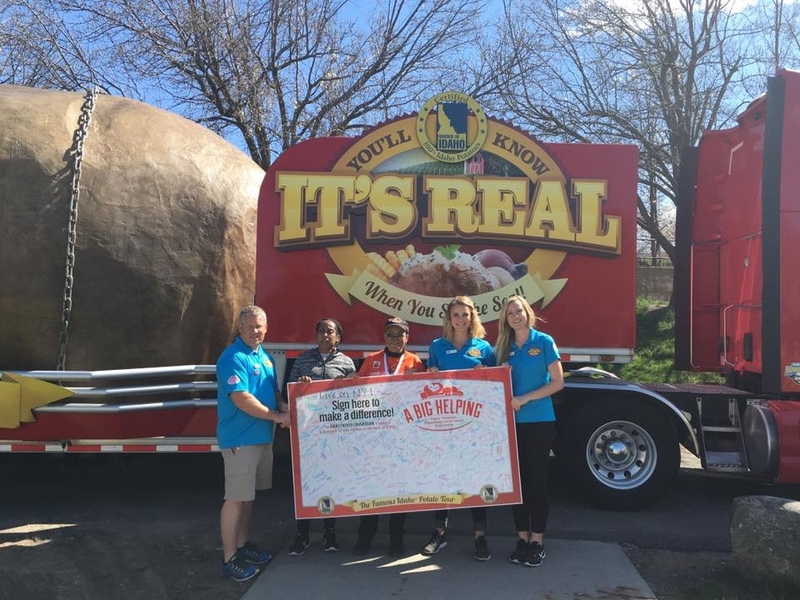 Using the Big Idaho Potato Tour’s charity, “A Big Helping,” we used a Signature Board and our sheer presence to help make this event stand out. The event came infused with a Potato bar filled with Idaho baked Potatoes. Rockland Community College has a Culinary Arts School, which provided the Idaho potatoes with all the expertise needed for top notch deliciousness. The #TaterTwins #AndLarry devoured their Idaho Potatoes with glee. 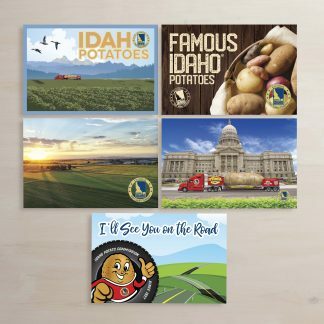 About 500 Idaho Potatoes met their end in the bellies of satisfied attendees. There were no Idaho Potatoes left at the end of the day. The event was packed with Political guest speakers, a live DJ, and a whole lotta Big Idaho Potato. We even had a visit from Spuddy Buddy. (Don’t worry, he waited until everyone had eaten their Idaho Potatoes before showing up.) Partnering with those who volunteer their time and often their own money, makes events like this one a complete honor. Roxanne has an energy and drive that places our visit with her, at the top of that list. The Tater Team handing off the signature board to the LiveOnNY team! We didn’t stop there however, on our road of giving. Our next partnership utilizing the “A Big Helping” program, was further south in Washington, Pennsylvania. You might be saying to yourself now, that you’ve never heard of Washington, Pennsylvania. 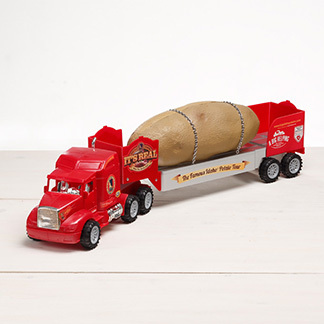 No reason to worry now, because the Big Idaho Potato Truck, the #TaterTwins #AndLarry, have now helped to put them on the map. We partnered with the Tri County Patriots for Independent Living, aka Tripl to help them to raise funds so they can help others learn to live independently. It brings people together to help solve these shared problems. They picked a busy roadway and obtained permission to park our event. The Big Idaho Potato was a draw for sure. Many people stopped to taste it’s deliciousness and many of those stayed long enough to sign our “A Big Helping” Signature board. Every signature raised another dollar for our charity partnership. The #TaterTwins #AndLarry had a blast interacting with both the public and the people representing the charity. These events help us to make new friends in what is to us, far away places. Our signature board once again was filled up to it’s full potential. Five Hundred signatures are needed and five hundred and one, is what we obtained. 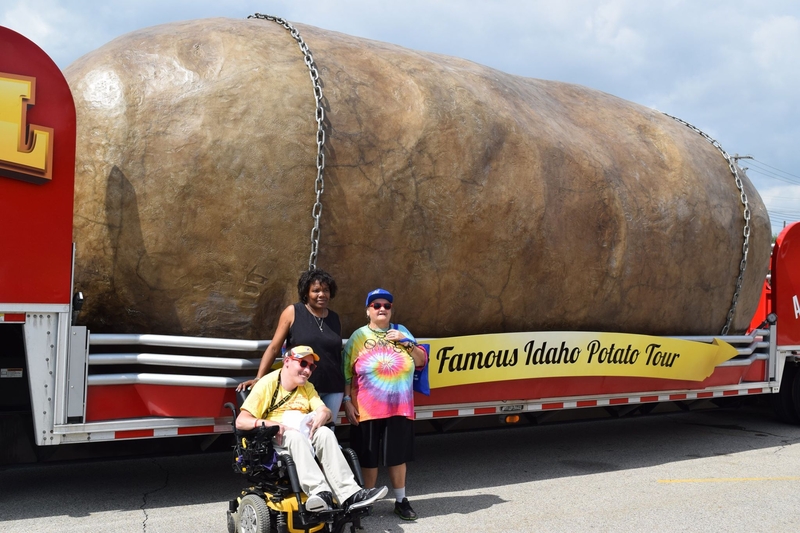 Some folks at Tri-County Patriots for Independent Living admiring our six-ton potato! There were many types of food, games, rides, and Big Idaho Potato galore. 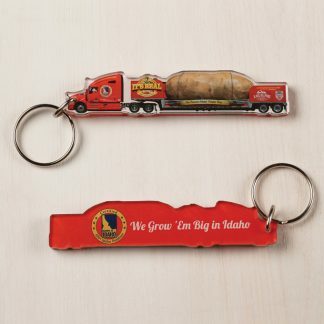 (Okay, just one Big Idaho Potato, but there were two #TaterTwins.) The day was filled too, with an air show that highlighted airplanes both young and old. There were many kinds of craft, even some from our northern neighbors in Canada. The Army’s Golden Knights made a few jumps too, making the #TaterTwins giddy #AndLarry jealous. #AndLarry Heroically offered to stand in to give one of them a well deserved day off, but there were no takers; they’re the true hero’s. As the weather improved, so too did the number of visitors. Thunder doesn’t only apply to the Airs how however, it also applies to the fireworks show that happens when the Sun hides again behind the horizon. This Fireworks show was paired with a taste of local musical talent. It was thirty minutes long and ended with a bang. The #TaterTwins #AndLarry have never seen so many fireworks going off at one time. The grand Finale was truly grand as the many flashes disappeared behind an immense cloud of smoke. This kickoff to the Kentucky Derby was again a spectacular event and the #TaterTwins #AndLarry had a fantastic time. 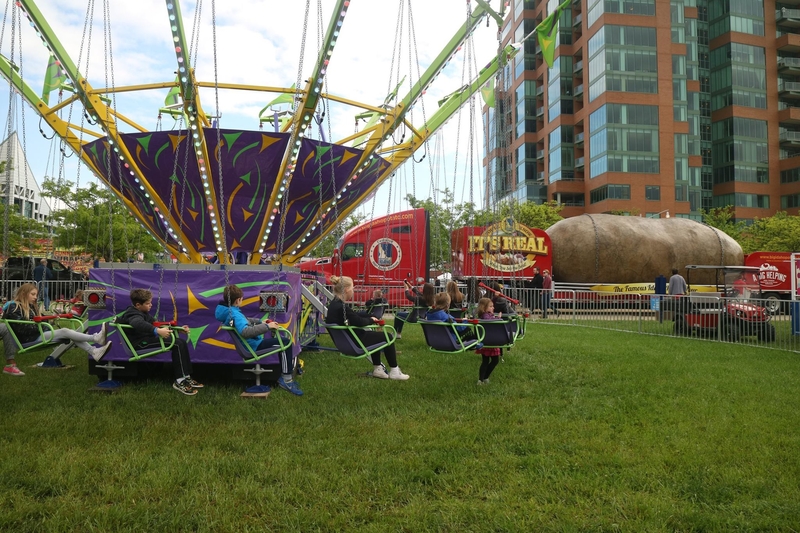 The Big Idaho Potato at the #Thunderoverlouisville grounds next to the carnival rides. This was a week where the weather didn’t always cooperate. It was also a week of weird routes on our permitting. The week was full of challenges for sure, but the true greatness of the Tater Team overcame them all. This was a sure sign of the true greatness of #AndLarry. #AndLarry is able to achieve this level of greatness because of the true greatness of the #TaterTwins. The #TaterTwins, Kaylee and Jessica, really are the brains behind the Tater Team. 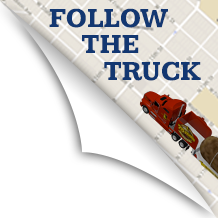 #AndLarry is just here to look good and to drive that Big Idaho Potato, safely on it’s way as it continues it’s adventures.